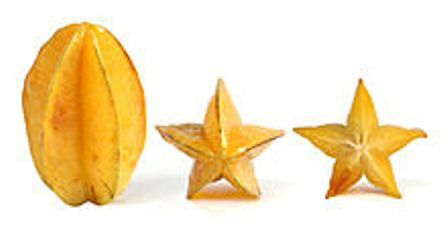 Wash and cut the fruits in slices(here u can c the shapes which resembles a star)..
Heat oil in a kadhai/pan and add pancha phutana to it..let the seeds splutter. Then add curry leaves and ginger..fry for 1 min. Now add the sliced fruit pieces with turmeric powder and salt to the kadhai. Fry for a minute and cover the lid.Cook in slow flame. After 4-5 min open the lid and add sugar/jaggery with some water and bring that to boil. After switching off the flame add the chopped coriander leaves with roasted cumin+red chilli powder to the above recipe and mix them thoroughly. Try to use jaggery or gud in this recipe, it'll give a better flavor and taste. Loved this chutney. Book marked it. yummy prep of star fruit. you got nice space. do visit me too.